Preschool Salt Lake City - How Much Do You Know About Screen Time? | Child Time Inc.
How Much Do You Know About Screen Time? Think you know everything you should about screen time for young kids? Test your knowledge with a quick quiz from our preschool! It can be all too easy to plop our children in front of a screen. It’s entertaining for them, it gives us as parents a much-needed break, and there are plenty of educational shows which can be enriching for them, right? Plus, some of our favorite memories from childhood are the nostalgic movies and shows we watched and hold so near and dear. Be that as it may, screen time isn’t all that beneficial. When provided in excess (and it doesn’t take much time to be considered “excess”), screen time can be downright harmful. 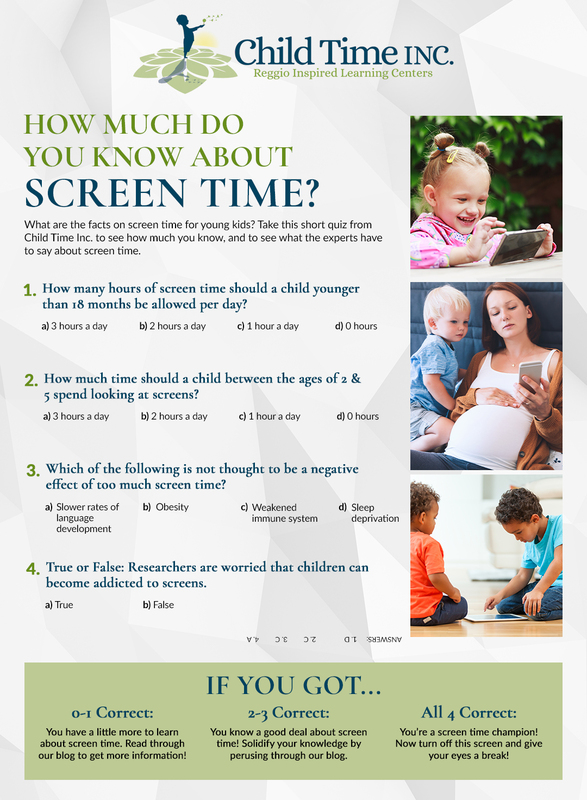 See some facts from our preschool regarding screen time, and feel free to call us with any other parenting questions you have regarding our programs, philosophy, hours, or more. Zero hours of screen time. There are no proven benefits, but there is thought that it could be detrimental. The research is ongoing and inconclusive, but many doctors worry about the addictive nature of screen time and how that could impact developing brains. “So what we do know about babies playing with iPads is that they don’t transfer what they learn from the iPad to the real world, which is to say that if you give a child an app where they play with virtual Legos, virtual blocks, and stack them, and then put real blocks in front of them, they start all over. No more than an episode or program of something (definitely age-appropriate, but preferably educational), and viewing should be done with another adult. Children’s brains are incredibly impressionable and susceptible during these early years — their brain’s development at this time can actually be an indicator for their success later on in life. No more than an hour of screen time a day. All the research is showing that too much screen time can have some pretty significant health effects for young children. Have you ever stared at a computer screen for too long and experienced tired or aching eyes afterwards? Headaches? Insomnia? These same things can happen with children. But at these younger ages, they a) don’t often have the vocabulary to express what they’re feeling and b) these side effects are more detrimental because children are still developing. In addition to eye strain and headaches, there seems to be a link between increased screen time and sleep deprivation, as well as obesity (though sleep deprivation and obesity also show some correlation as well). Quality and appropriate quantity of sleep is a necessity for everyone, but children especially need proper amounts to fully develop and grow. As a final note (for now) from BabyCenter, “One study found that in children younger than 4, the more hours of television they watched, the fewer words they learned.” Language acquisition is immensely important at young ages. Take this as just another reason why you should try to cut back on the screen time for your young one. A maximum of two hours per day. There are still a number of cognitive, social, and emotional delays that come from screen time. And to be clear, this means all screens. Phones, tablets, TV shows, desktops, laptops — the limit should be capped on two hours for children from the age of five and up. Not only is this good for them developmentally, emotionally, and socially, but life happens outside of screen time. You don’t want to miss it, and you definitely don’t want your kids to miss it. 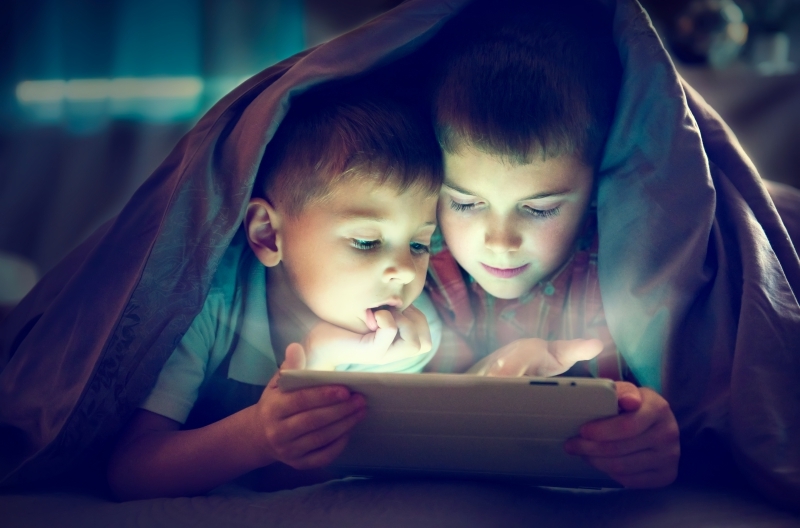 If the go-to method for relaxation is to tune out life and destress with screens, it’s time to reexamine how screen time is being used, and how your family can more effectively manage their downtime and energy as a whole. Our preschool gets it. There are three million things that parents need to do. Between cleaning the house and cooking dinner and doing laundry and giving yourself a minute to breathe, the list of to-dos is never-ending. Every parent uses screens as a way to distract their child for a moment, and you are completely normal for doing so. In fact, many researchers recognize that the growing demands that are placed on parents are the very reason why screen time for young kids has increased in recent years. What can you do, then, to have the time you need for parenting and adulting while also giving your child the best possible care and environment? Look into high-quality child care options, such as the programs available at Child Time Inc. We have four locations in Salt Lake City — The Avenues, The Second Avenues, The Eastside, and The Cottonwood Preschool — all at your family’s convenience and for your peace of mind. Implementing an educational curriculum through Reggio Emilia methods, you can count on very minimal screen time. We know how important a growing child’s mind is, and our preschool is committed to helping your child truly thrive. In our next blog, we’ll go over some ways to set screen time limits for the young ones in your family. These limits, when set and upheld, can make it easier than ever for your family to abide by healthy screen time usage — and even strengthen your connections and bonds as a whole. Stay tuned, and set up a tour with Child Time Inc. to get the very best in child care and preschool!